Minard’s graph showing the destruction of Napoleon’s Grande Armée in 1812-1813. You can find an English translation of this graph here. How many types of data are presented on the graph? It is a map, so there are coordinates (not labelled!). There is the width of the line which indicates the size of the army. There is the temperature plotted for the retreat. Minard’s graph is recognized as one of the greatest. All classrooms discussions of statistics need to showcase such complex, multivariate examples of how to tell a story with data. 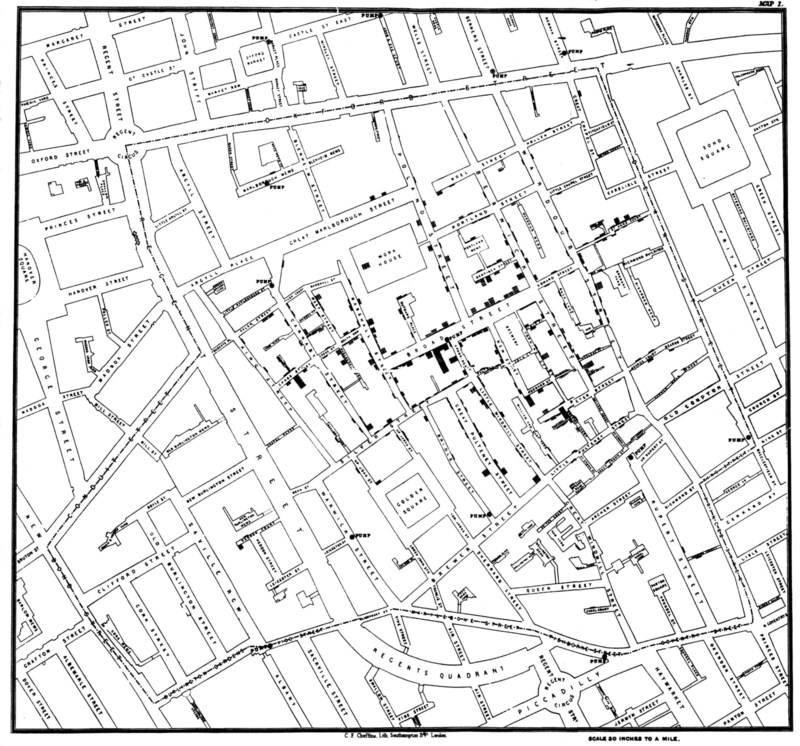 Dr. John Snow collected data on the cholera outbreak in London in 1854. Each line behind a door indicates a death. The prevailing theory was that the sickness was due to bad air. This map pointed to the Broad Street pump as being the culprit, but was this due to a bad smell emanating from the pump – or from something in the water that people were drinking? The statistically riveting story about this map and the data anomalies (like the brewery workers who stayed healthy) make for a fantastic story for all students of statistics.